After not doing anything for a bit, we appear to be back. I'm jacked when we hit 24 kts. I cannot imagine 65 kts. I am aware of a few nice boats for sale on the beach right now. 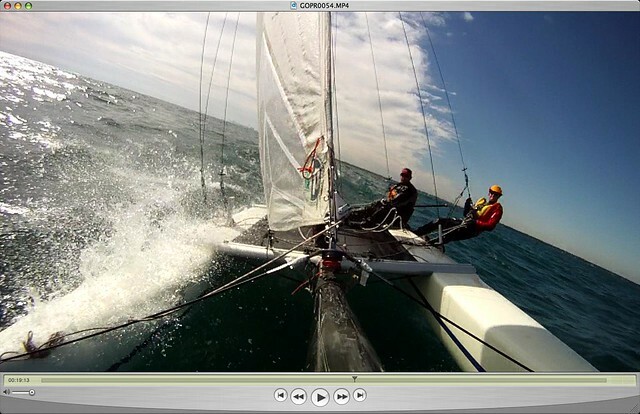 - a Nacra 5.8 NA (the big jib). In near perfect condition. - a Nacra F-18 (pointy bows). In good condition. If you are looking to trade up from your H16 and be one of the cool kids, shoot me an email, I'll get you in contact with the right skipper. Anyone watching the weather? It looks like a nice low is going to blow in late Tuesday night. Wednesday post work sailing looks promising. If you did not get on the water this weekend, and most of you didn't, I'm sorry. Saturday we were treated to a NW breeze 20-25 kts. I had rookie crew flipped and exploded a jib that was on it's last leg. Several other veteran sailors had bobbles and capsizes but didn't care, I was just too much fun. Sunday had a slightly more mild encore, but still fun. Ed and Ronni killed it in the morning while the wind was still above 20. Later ... Bobby Findlay and I sailed up to Tower Rd. I was able to get on the wire a couple of times. Around 5:00pm a steady 12 kts filled back in an I headed out solo, goosing the Nacra with her new sails to 18 kts single handed on the wire. Scott had his family out for a cruise on his 16. Jerry and Greg were out on their boards. Life was pretty good. kiteboarding + hydrfoils + multihulls = fast fun with friends. so how did they nominate the guy who is harnessed up to the kite (and attached fast to the boat)? Scott and I head out on December 11, 2011 (at an undisclosed location) for some winter sailing. Hope everyone has a safe holiday season. 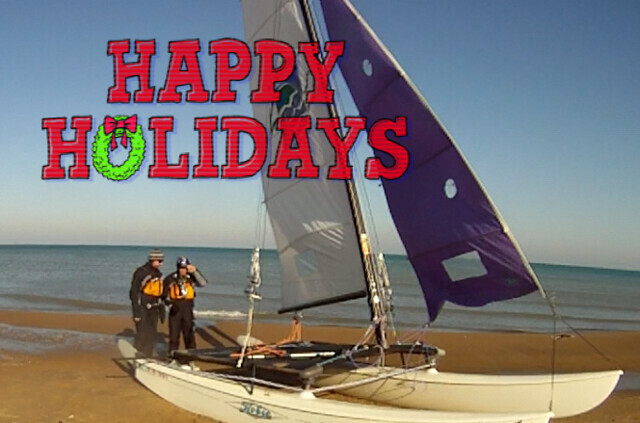 Monday, November 21 the Park District "Parks and Rec Committee" voted to keep the "Sail at Your Own Risk Policy". The underlying discussion was whether or not the Park District should change the policy and close the sailing beach on "Red Flag" days. About 20 sailors showed up, about 10 spoke giving reasons/recommendations to keep the policy as-is. No sailors spoke in favor of changing the policy. One "local politician" spoke out saying the park district does have some responsibility to close. One committee member strongly disagreed with this "politician", stating 'if a sailor wants to challenge themselves and understands the risk (and policy), then who are we to stop them'. Ahem brother, well said! There will be a change to the wording in the beach contracts surrounding the rescue boat and when/how/why beach staff are inclined to provide assistance to sailors. This is yet to be finalized, but expect the word "rescue" to be eliminated. 54 degree air temp and 20-25 kts from the NNE made for some big waves and challenging conditions , so what do you do? Grab the boys and head out of course. 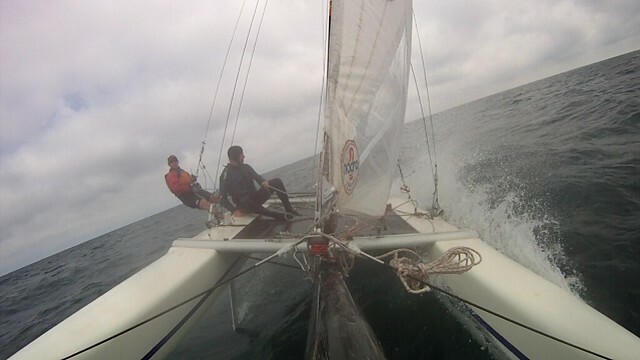 Not a long sail but an intense one ... and it's on video! The crew performed to perfection as did the boat. kudos to Ed for staying aboard. Step 1. Winds from the NW, waves from the N. Liftoff... note leeward hull. Step 2. Prepare for re-entry. Epic day... Ed only had a couple hours so he and I teamed up and had some fun. You should see the video from the downwind legs... we were nuking.